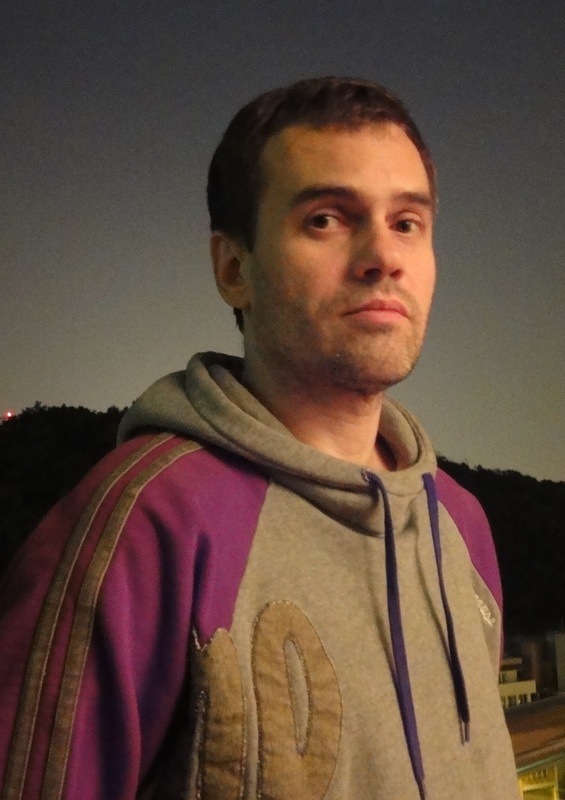 Clay Gold is a sound artist, audio engineer and compulsive field recordist. Having previously lived in Moscow and Macau for extended periods and toured with music and theatre groups worldwide, he is now based in Canterbury, UK. Sound design and composition work includes film, installation and performance pieces, both solo and also in collaboration with actors, musicians and voice artists. Combinations of location recording, synthesis, Foley, Worldizing and poetry are used to create multi-channel soundtracks which are both musical and cinematic. 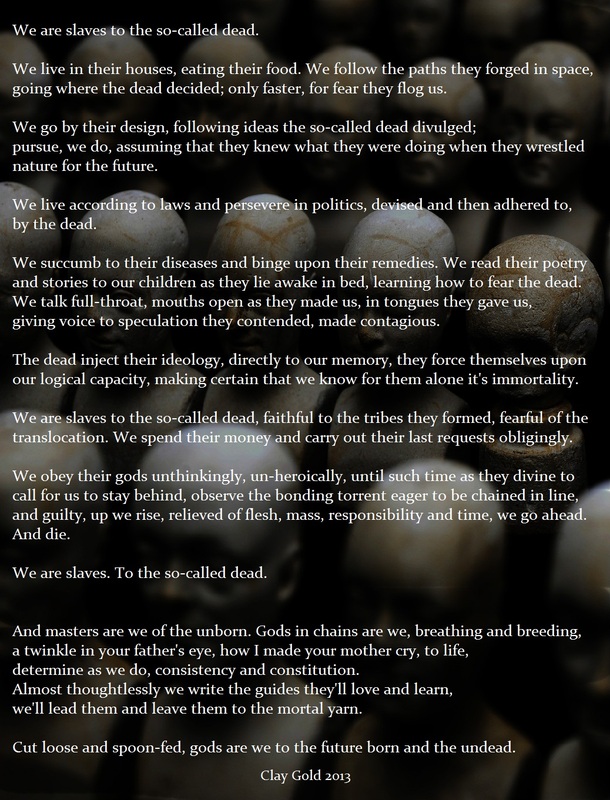 Inspired as much by John Cage and Karlheinz Stockhausen, as by Walter Murch (THX1138), Stanley Kubrick, Arthur Lipsett and the music of Edward Artemiev from the films of Andrei Tarkovsky, Clay Gold explores the way in which sounds occur and operate naturally, as an alternative to cultural expectations and perception. An interest in cybernetics and ecology, with particular consideration paid to the application, destruction and preservation of information, within and without the constraints of the human mind, form part of an exploration into suppressed and promoted opinion; or censorship and propaganda. In March 2011 a 5.1 piece - 'Airtight Orange Plastic Coffin' - a filmless Horror soundtrack - was commissioned by art collective ((audience)) and presented in a completely dark cinema environment at the Walter Reade Theater / Film Society of Lincoln Center in New York City as part of 'UNSOUND', a festival of experimental music and sound art. The piece continues to tour as part of ((audience2)) – a cinema for the ear - in the U.S. In April 2012 Clay Gold recorded, in its entirety, Rupert Murdoch's interview with the Leveson Inquiry, and cut it up into 180 samples for the composition 'Distortion 1', which, when uploaded to the internet two days later, caused a minor flutter on Twitter and was listened to over a thousand times in a few hours. In September 2012 an acousmatic piece of musique concrete entitled 'A Furious Devout Drench' was named as one of ten finalists in a contest arranged by European Acoustic Heritage. As a result, the piece toured with an exhibition in Finland, France, Belgium and Spain, and a year later was presented as part of Acousmatica IX in Helsinki. An enduring collaboration with Filmgruppe Chaos of Kiel, North Germany, has produced seven short films and one experimental dual-projection 5.1 documentary, from 2013 to the time of writing; several of these have been screened at film festivals in Germany, Holland and China. 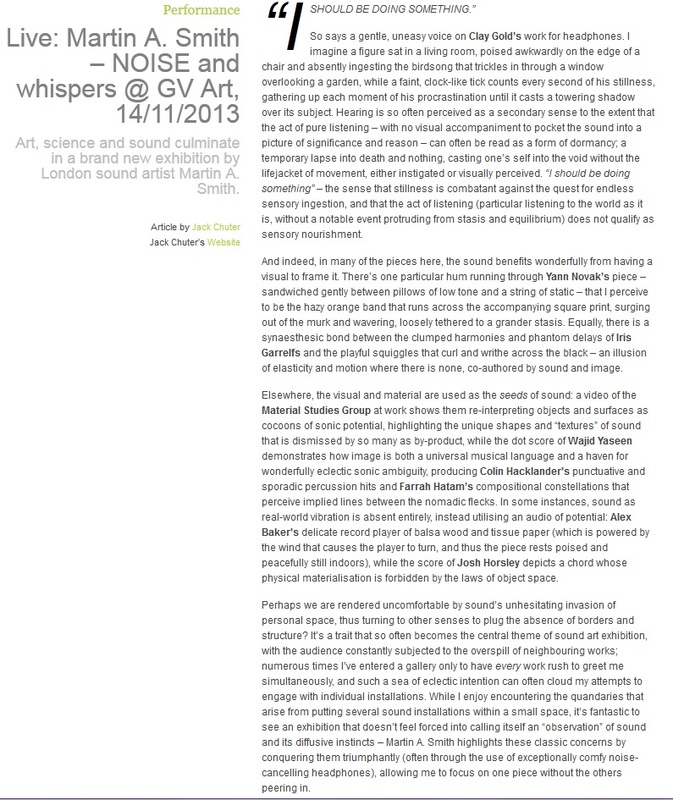 An installation called 'The Opposite of Wilderness' was included as part of GV Arts 'Noise and Whispers' exhibition of sound art in London during November/December 2013. This ran concurrently with a second installation - 'Distortion 6' - which played throughout the first 'Symposium of Acoustic Ecology' held at the University of Kent, Medway. A trilogy of recordings have been released through the Parisian netlabel 'Threelegs Duck', entitled 'Clay Mining' (2011), 'Breathing to Death' (2012) and 'Stay Where You Are' (2013). Clay Gold is an occasional bassist with David Toop's improvisational group 'Unknown Devices', and a collaborator with alt-cellist Laura Moody from the Elysian Quartet; he has written a book called 'Operation of a Complex Fuzzbox', and several libretti, including 'BIAS' for the choir MUSARC (in association with the Sound and Music 'Portfolio' scheme), and a spoken word piece - 'The Future Born' - for a film - 'Death à Gogo' - by Filmgruppe Chaos. He is often to be found in a shed in rural Kent staring at a microphone or a loudspeaker. His wife, Maria, is fond of Philip Larkin's poem 'The Literary World' and together they have two children, Vera and Van.